“Maintenant, non de maladie, mais d’epuisement, elle commence sa mort, j’arrange ses oreillers, ses cheveux, Samora aux grands cheveux, l’aide a boire- de quel absolu a-t-ell encore soif? Elle m’a toujours aime comme mes soeurs et freres, mais l’oevre que je fais et meme quelques-unes de mes activites politiques et sociales d’alors, Comite de soldats, prostituees de Lyon, etc., la troublent. Ainsi qu’une de mes soeurs fait, jadis aupres de ma mere dans ses derniers mois, qui depuis quelques annees, voulant distribuer egalement son amour a tout ses enfants, la prive du surcroit d’affection qu’elle lui donne d’ordinaire, j’entretiens et prepare sa beaute pour sa fin, pour elle, delivrance vers l’au-dela- mais que lui reste-t-il alors de sa foi? Notre mere, pres de sa mort, avant que nous ses fils rentrions dans sa chambre et jusqu’au matin de sa journee d’agonie a laquelle nous prenons tous part, se fait et laisse embellir par nos soeurs. Elle meurt une nuit apres ma visite. Comme elle a donne son corps a la Science, que c’est la soeur de notre mere, je peine a sortir de la salle de morgue ou j’ai aide a ranger son corps dans le tiroir, j’ai mis dans ses mains un petit bouquet et un mot pour les “depeceurs”. Son enterrement: je me retire de la comedie, je reste dans notre exception commune. I have read and recorded some of the exhibited pages of the Third Mind manuscript at Brion Gysin’s show at the New Museum. I usually indicate the page of the book before the reading. A series of correspondences, resonances and associations that I wouldn’t ascribe to chance, occurred in NY this summer. I wouldn’t attribute the following connections to chance but to the over systematization of desire at work in the ultimate stage of the capitalistic machine. A stage where its very motor, desire, is on the verge of extinction as each hearth of fire, or sparkle of interrogation is tamed by an immediate response in the real. One could also reverse this hypothesis and read the relation between these different events as an act of desire, where the mind creates a series of associations and connect things that would otherwise have no link. Some time back in Beirut, I read a passage in one of Kathy Acker’s interviews where she declared that she taught herself to write (a notion that I find very appealing) with William Burroughs’s book ” The Third Mind” (which I was convinced to find in NY). After visiting a number of independent bookshops, a curious librarian informs me that the book is out of print. I wonder why. I meet with Barrack to upload “How to make (nice) things happen” on ArteEast’s website. While discussing the reasons of my visit, I mention that I am also looking at some PhD programs and that I am considering the one at Tish. Barrack tells me that he was himself a former student in performance studies (MA) and that he will put me in touch with some friends, but that I might not receive an immediate answer because they are all thoroughly affected by the recent death of one of the students. R. Ganahl-Austrian artist living in NY, whose work I really like and who is notorious for riding his bike at all times- gives me an appointment at David Zwirner gallery for the opening of Al Taylor’s show. Soon after, we need to get to another opening in Soho and, to reach our destination more quickly, he takes me on a bike ride with him. Seeing NY from his handlebar made the city feel very much alive… (on this encounter I have written something). Zeynep and I were vehemently defending our views on what it meant to occupy a position. I argued that I didn’t want to apply for a curator’s residency but for a writer’s residency. She argued that her choice would not be determined by these categorizations but by the nature of the project itself. Although I agreed with her, I also had the desire to identify with something and fully embrace it, taking responsibility for what it meant to be a writer. It would also alleviate the burden of not knowing always, where I stand. I also added that if I did a writer’s residency, I would meet other people with the same inclinations, which was closer to what I wanted, that basically I wanted to find a family with names and books and that references where characters I lived with. Hence, pertaining to a family with a tradition, that could and should be subverted certainly, but in order to do so, had first to be acknowledged. I have an appointment at NYU with Noel Rodriguez to know more about the PhD in performance studies at Tish. I arrive 30 min before our scheduled appointment. While I was waiting in the lounge, I noticed a picture of a young man and a vase with white flowers placed next to it. I ignore it. While Noel is describing the program’s excellence and the type of learning environment I will be studying in if I was ever accepted, he refers to the department as a family. He adds that the picture in the lounge is a former international Greek student that had very recently died in a bicycle accident. Students and faculty were very afflicted by the loss, but, he also added that there was also something beautiful in realizing that the department acted like a family. By the end of our meeting-that had somewhere left me speechless and undecided as whether I wanted to be an academic- I asked Noel if he himself had pursued a PhD here. He answered that you know, he had a family and that… you know. I visit the New Museum to see the Bidoun Library. On the second floor is a show by Brion Gysin, where I see exposed the “Third Mind” a manuscript he has developed with Burroughs using the Cut- Up methods. The book was never integrally published because the printing would have resulted too expensive. A shorter version of the book was published in France in the 70s. It is now out of print. I noticed at different times, the time in the metro, 3: 45 pm, and later. I remember that today is her birthday. I have noticed that while writing, only an idea is capable of animating my words. I cannot write for the sake of writing, as I find no pleasure in that. I write when intrigued, shoved, or excited by an idea, only then my words can take new meanings, through the juxtaposition of the mind, before the formality of words. I do not want to define a point of departure, but I observe the moment of action; taking up a pen, opening a words document. What is it that moves your fingers, and mostly, what keeps them moving? 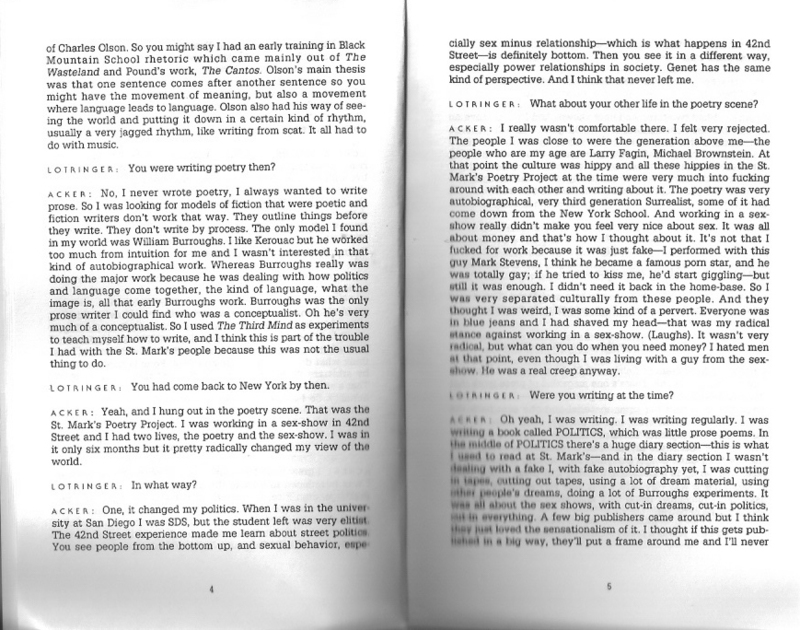 I was reading a really inspiring late interview with Kathy Acker by Sylvère Lotringer, published in Semiotext(e), Hannibal, my Father, a collection of Acker’s early writings. 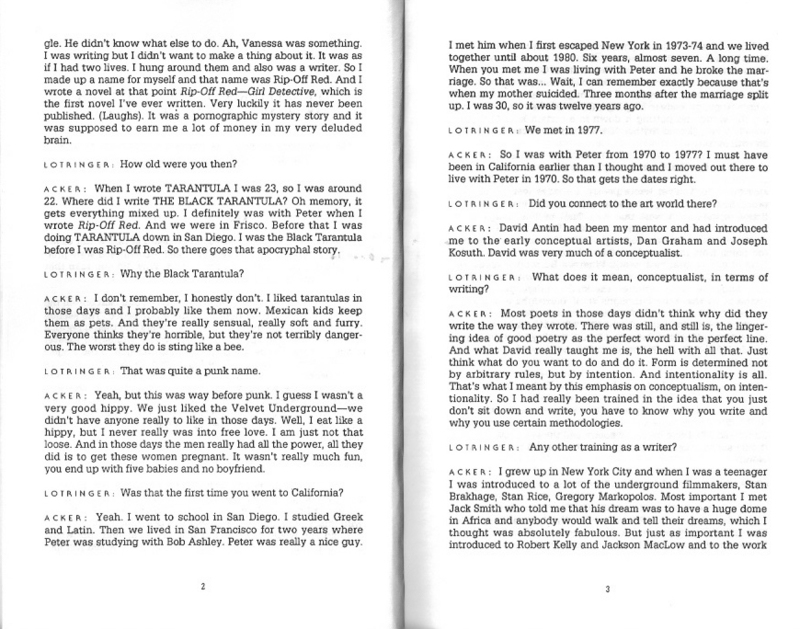 I am posting two pages where Acker describes her relation to inspiration, writing and concept. Is a quote that I read in Aristotle’s Nichomedean Ethics and that somehow relates to what I am about to say. This piece is particular because it addresses concerns that are comparable to points of tensions since they are layered and whole at the same time. It is a about time, experience and perception. Again about organic residues which sometimes solidify into haunting and paralyzing images. About contemplating time while longing for some more, and observing seasons go by while remembering scenes dating from a year ago as if they were taking place today, as if time was a perfume. “You still have time, I mean you are not 35”, she said while sipping her coffee. What determines if you still have or don’t have time, and for what? For doing all the things you are suppose to do by that time, 35, to achieve, give birth, be recognized and loved while loving. What her sentence meant is that your time is externally determined and that you have to abide to its temporality. In the past years, I have not only been abiding and giving in to these external impositions, but also challenging them. Age was never really my concern because I was always a step ahead; at 23 I was working in a museum, at 26 I had a masters, at 27 I started my own organizations, and now I am almost 30. Fortunately, other things happen that can scramble this slick temporality, confuse it and hijack its routes. Things that you may not want to acknowledge but that are there and will be until you do. Pain is one thing, and fear is another (Why he could not get it hard remained a mystery to me. He had given up on understanding, since there was nothing he said,to understand). I am 30 now, and of what I have achieved or failed to achieve, little remains or little stays since success-imposed temporality is only immediate; the moment of success is already conditioned by the next step in that same path. On paper, I have accomplished a few things in the last 5-years. I have decided to write them down, together with major events that have occurred in my life. 2006 (month? ): I quick working at MACRO (museum of contemporary art in Rome) after two years. 2006 (summer): I decide to go to Beirut during the war to see my mother. I leave some of my things at Manu’s place. 2006 (Sept): I move to London from Rome. 2006 (October): My mother passes away. 2007: Spend the summer in London writing my thesis and go to Rome, where Manu and I break up. 2007 (end): 98weeks is established. 2008 (Beg. ): I move to Beirut. 2008 (summer): I go to Venezuela with my father (a couple of months before, my Venezuelan grand mother dies). 2008 (summer): I meet Fares, we date during the summer. 2009 (February): I start teaching at AUB. 2009 (April/ June): Fares and I start dating. 2009 (August): I move out of Marwa’s place and move in with Fares. 2010 (August): Thinking about something else. It has been August since December, while I was already apprehending the summer heat. My apprehension kept me from being cold, in fact there has been no winter this year. There is an electricity cut and we are holding our breaths as to not consume the last blows of fresh air in the bedroom, the door is kept closed and my hair is wet from the shower I just had. If bad people are full of regrets it is because their acts or non-acts are conditioned by the temporality of success (taken in a broad sense), which dictates attitudes that can’t be ultimately justifiable because never experienced (when doing is solely driven by an outcome. When the motivation for an action responds to an external criteria). Within these CV timelines, events occur, which take you back, and forth again and where the future is reconsidered under an old light. (He decides to open the window because it is too hot in here). Ears are cleared. A roaring sound takes hold of you through your fingertips and your left ear. While his feet are dancing, he raises his hand, then his fists in a fascist gesture (can’t read). His hips remain rigid. Arched above his head, his brings his arms down, flickering his hands like a flying bird. We are surrounded by sound and didn’t know it. He is now staring at the wall, placing his head into the hole. Using the wall circumventing the cavity to produce more sound. The wall resonates; his hands follow while his shadow doesn’t. He appears taller than he is, black and white at the same time. I sense that the performance will end…not quite yet. He is now using the white flour square and dancing in it. It looks beautiful. The flour pillows the sounds of his feet. The moment is dusty, smoky and quite spectacular. Who is he talking to now? I don’t want the performance to end. He is now on the stage again, kicking and clapping with his hand and his mouth, his knees and heel. As he walks away from the flour, I think that the performance might end, now it is raining again. He stops the steps are barely visible but they generate infinite sound, the guy next to me, the rastafari guy, is patting on the stairs. He tries to follow the dancer. He drags the chair on the floor, more noise, the same one. He is still majestic, no sound. He starts singing flamenco folkloric songs and these are the moves that I like, the rhythm in the hips, Shakira. There is a little bit of hip-hop as well, with ballet and tap dancing and Michael Jackson is definitely in the room. He takes off his shoes, and his socks, pulls away his trousers, now the other sock. His back is wet and his shirt clings on his back. He throws his shoes into a wooden circular shape, walks bare foot here and there. The sound is overwhelming and penetrates through all my skin pores making the flesh tremble. He curves his back deeply and raises his hands highly. He does the same moves but silently. He is very silent now, like bull in an arena ready to charge.